The researchers were the first to ever see this rare shark species, the spongehead catshark (Apristurus spongiceps), alive in its natural habitat. Previously, only 2 specimens had been documented; both were pulled up by trawls. Click image for larger view. The slopes of Northampton Seamount are steep! Acoustic mapping identified regions where the slope dropped from the 50 m summit down to 1,000 m in less than a kilometer. This afforded us a unique opportunity to examine a wide range of depths in a single 8-hr dive on the Pisces IV submersible. Four such dives were conducted. The submarine would first drop down to about 1,000 m, then slowly work its way up into the shallows. During these dives, some rare species were encountered and key habitats documented. At 1,000 m, the sand swept off the bank by currents settled and formed dunes reminiscent of a wind-sculpted desert landscape. The bottom was punctuated with colorful sea cucumbers and anemones that get as large as a lunch boxes. Many long, eel-like fish were seen cruising over the dunes. Three fish were particularly exciting. 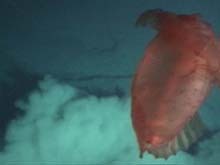 One, a bathygadid, had long filaments extending from each of it fins, making it appear as if it were walking on stilts rather than swimming. The second was the angler fish, which sits on the bottom, like a frog, waiting for prey to be attracted to its mouth by a filamentous lure on its head. Seeing this fish establishes the third known locality for this species. 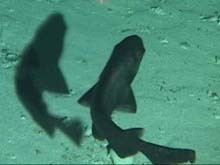 Most significant was the first in-situ sighting of the spongehead catshark. Prior to this expedition, this species had never been seen alive in its natural habitat. A flying holothurian, or sea cucumber. Click image for larger view. Moving up the slope, we saw large islands of rock in the sand bottom, which provides a stable place for sponges and anemones to colonize. Some sponges grow as white columns up to 2 ft in height, and can form dense patches at sites of high water flow. The slope quickly turns into a sheer cliff, against which the Pisces IV ascended vertically and hovered so we could observe the animals living on the wall. Some of the walls were straight; others were fluked with canyons eroded by time. 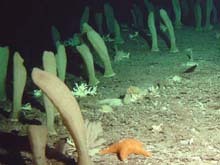 Several patches of corals found between 400 and 600 m were colonizing ridges of the walls that were free from the constant scouring of sand draining from the seamount's summit. At the deep extent, we saw some large beds of a crustose coral, which grows in bright orange fans, many of which are more than 2 ft tall. Further up and in much less density, species of pink corals formed smaller fans on the vertical and overhanging portions of the walls. Gold coral trees appeared in a few patches between 400 and 500 m, always on corners of the walls where the current flow was high. The higher the current flow, the more corals and the larger the "trees." The largest ones were more than 6 ft. tall. Fish at these depths are more colorful than the darkly colored deeper species. Their bright colors include silver, blue and red. A field of sponges with a few corals interspersed. Note the sea star in the foreground. The sponges stand about 2 ft tall. Click image for larger view. At shallower depths (200 to 400 m), more familar fish appeared, including many of the commercial bottomfish such as snappers and the Hawaiian grouper. Despite our familiarity with this depth range, we discovered the veil tail goldie, a spectacular fish with an ornate gold tail. This species was first seen last year on dives at French Frigate Shoals and was thought to be a waif washed in from elsewhere, not a resident species. Finding numbers of them on Northampton, however, has revised that notion. At 250 m, some species from the shallower reef systems were seen. The shallowest depths were surveyed using the ROV (remotely operated vehicle) RCV-150. The summit was primarily flat, supporting a carpet of large algae and some isolated heads of coral. Finally, as expected, we found large reservoirs of sand sitting on the summit.